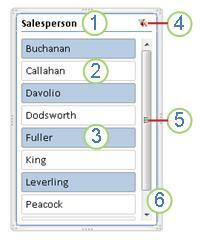 Slicers provide buttons that you can click to filter table data, or PivotTable data. In addition to quick filtering, slicers also indicate the current filtering state, which makes it easy to understand what exactly is shown in a filtered PivotTable. When you select an item, that item is included in the filter and the data for that item will be displayed in the report. For example, when you select Callahan in the Salespersons field, only data that includes Callahan in that field are displayed. On the Analyze tab, click Insert Slicer. In older versions of Excel, click the Options tab, and then click Insert Slicer. A slicer is displayed for every field that you selected. Please note that this feature is supported using Excel 2013 and later. 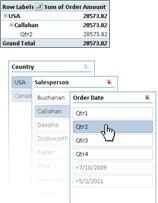 Click anywhere in a table for which you want to create a slicer. On the Insert tab, click Slicer. In the Insert Slicers dialog box, select the check box of the fields (columns) for which you want to create a slicer. Click OK.A slicer is displayed for every field (column) that you selected. Click the slicer that you want to format. If you have a slicer on a PivotTable already, you can use that same slicer to filter another PivotTable. Please note that this only works when the two PivotTables use the same data source. First create a PivotTable that is based on the same data source as the PivotTable that already has the slicer you want to reuse. On the Options tab, in the Slicer group, click Report Connections. Please note that in older versions of Excel this button may be called PivotTable Connections. Click anywhere in the PivotTable for which you want to disconnect a slicer.This displays the PivotTable Tools tab. In Excel 2016, click the Analyze tab, and then click Filter Connections. In older versions of Excel click the Options tab > Insert Slicer > Slicer Connections. In the dialog box, clear the check box of any PivotTable fields for which you want to disconnect a slicer.